R&B star R. Kelly has been released from a Chicago jail after posting his $100,000 (£76,000) bail, a Cook County Sheriff's Office spokeswoman said. Earlier on Monday he pleaded not guilty to 10 charges of aggravated criminal sexual abuse against four women, three of whom were minors at the time. The 52-year-old, dressed in a blue coat, did not speak to media as he was escorted from jail by his lawyer. He had turned himself in to police on Friday and spent the weekend in jail. The singer has faced decades of sexual abuse claims without being convicted, and has denied all previous allegations. 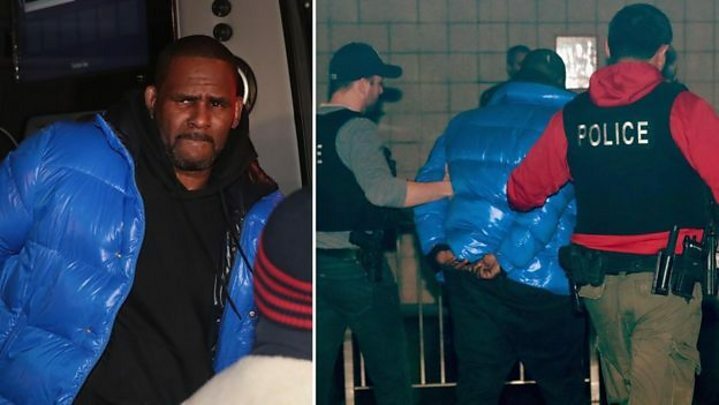 Cook County Sheriff's Office spokeswoman Sophia Ansari confirmed on Monday night R. Kelly had raised the $100,000 bail, which was 10% of the $1m bond set by a judge over the weekend. His court appearance and plea came weeks after the documentary series Surviving R Kelly aired. It contained allegations of abuse from many women including the star's former wife. He is being tried for sexual assaults alleged to have happened since 1998. He met one of the four women at a restaurant on her 16th birthday, and another - who was also 16 - when she asked for his autograph. The court ordered the singer, whose real name is Robert Sylvester Kelly, to surrender his passport and to have no contact with anyone under the age of 18. He had reportedly struggled to pay the $100,000 bail payment required to leave Cook County Jail. Later on Monday, high-profile attorney Gloria Allred said in a news conference that she was now representing more than six women who allege the singer abused them. R. Kelly is next scheduled to appear in court on 22 March.